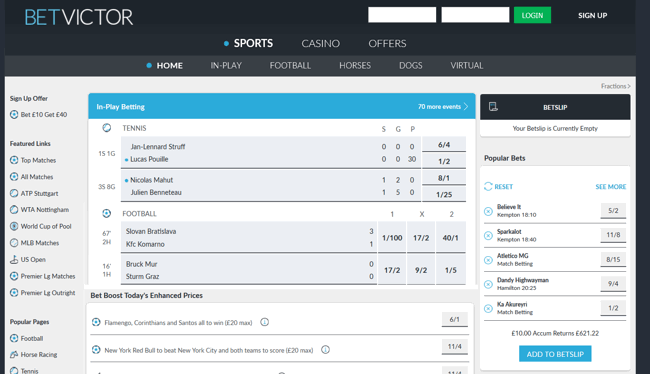 If it’s a betting site that is packed to the brim with promotions, betting opportunities from around the world and live streaming, then you’re going to love the BetVictor site. It really is one of the best online betting sites around and there’s never going to be a dull moment. Known as the gentleman of bookmaking for a reason, this is a seriously professional website and operation. If you are looking for flashy graphics, twitter feeds and stupid features then don’t go to BetVictor, if on the other hand you want a reliable solid online bookmaker you really cannot do better. As good as Bet365 in my opinion…. and that is saying something. A huge value 400% offer worth £40 is available when joining the BetVictor site. You simply need to be a new customer and go through the swift registering process. During that you’ll be asked whether you want to ‘opt in’ for the offer, you don’t have to accept immediately and the welcome offer is available for up to seven days after you sign up. Once you’ve made your first deposit (unless made via Neteller or Skrill), a £10 qualifying bet is required and this has to include at least one selection with odds of Evens or greater. For this you will get three £10 sportsbook free bet tokens (one unrestricted, one for any in play bets and one for an accumulator with 5 or more picks), all of which are valid for one week with cash winnings. The casino bonus is valid for three days and comes with a 40x rollover before you can withdraw. The majority of slot games contribute 100% to the playthrough, see full terms on the BetVictor site for more. As soon as you go to the Sports section of this site you’ll be struck by the large number of betting markets that are available to you. BetVictor cover all the main sports that you’ll be dying to place bets on. There’s football coverage galore with matches from all over the world at all times of the day. Perhaps not always the teams you know and love but a win on FK Yenisey Krasnoyarsk can make profits just as much as a win on Manchester United does. The same goes with their tennis coverage with matches covered for all the major tournaments week-in and week-out. Horse racing fans will never be short of something to place a bet on. There’s coverage of all the racing in the UK and Ireland as well as other countries including South Africa in the mornings and the USA in the evenings. There’s plenty of betting available for events outside of the sporting world including politics and reality TV shows. Don’t miss out on all the virtual sports that are available on the site. That horse may not have a heart beat but it can still win some money for you and the graphics are fantastic. For each event there’s a wide number of markets available. This includes Handicap betting, match betting for horse races and how many rounds the big fight will go. Who’ll win the Eurovision Song Contest Semi-Finals? Which club will be the first to be managed by Thierry Henry? A new feature for horse racing fans is ‘Lengthen the Odds.’ This is available on UK flat and National Hunt Racing. This offers you enhanced prices on your selection as you bet on not just it winning but the distance it’ll win by. There’s a whole page dedicated to this market so easy to find and bet on. There’s also plenty of ante-post betting and these can prove to be very lucrative if you take an early price. Any one who backed Leicester to win the Premier League will tell you that. Odds are highly competitive thanks to the many Bet Boosts that offer enhanced prices. These do have restrictions on how much you can place on them but are well worth taking up. Live betting is always exciting and it allows you to be continually betting on an event while it’s still taking place. BetVictor offer their customers plenty of chances to bet on live events from all over the world. This is particularly the case with sports such as football, basketball and tennis. Football matches from all over the world are covered on the site. Whatever the time of day you’ll find plenty of opportunities to settle down and follow a game. Odds are changing all the time and if your selection isn’t winning then you have the chance to bet on the other team and make some money that way. There are always lots of tennis and basketball games being covered. Action takes place all over the world so it doesn’t matter what time of the day it is, there’ll be something to bet on. Everything is perfectly presented to the player with a special section for each sport that the site covers. Finding the match you want to bet on presents no problems at all. This is the real strong point of the site with plenty of excellent promotions always available. Keeping track of everything that’s going on isn’t a problem at all, just click on the ‘Offers’ page. Taking an early price can be really risky. Sure you might get some days when you go for a horse at 10/1 and you gleefully watch as it shortens to 5/1 and romps home. But there’s always the time when the opposite occurs. That’s no problem when you bet at BetVictor though, take an early price or Board Price and if your horse goes off at a higher Starting Price, that’s the price you’ll be paid out on. If you love placing accumulators then you’ll adore this site. BetVictor have a Best Price Guarantee on Football Accumulators that have at least five selections. If that bet would have paid more if placed with another selected bookmaker then BetVictor’s Price Promise will pay the difference. There’s also Acca Insurance, for example you can receive your stake back as a free bet (up to £25) if one leg of your bet lets you down. Also keep an eye out for the special bonuses the site has. This includes First Goal Scorer Bonuses. Cash Out is another great feature on this site. There’s no need to wait until the final whistle to get a return on your bet. With Cash Out you can end your bet and make a profit or salvage some cash from a losing one. Simply look for the Cash Out sign next to the event. Partial Cash Out is also available. You can use a slider to determine just how much of your bet you want to cash out leaving the rest to continue. There are several ways in which you can make deposits into your BetVictor account. The site says that UK and Ireland customers will find their debit card the most convenient way to deposit their funds. BetVictor accept Visa Electron, Visa Delta, Switch and Laser Cards as well as Paypal, Neteller and MasterCard. All transactions are completed on a secure link and are part of the SecureCode scheme. The minimum deposit you can make is £5. The minimum amount you can withdraw is £10. Withdrawals to credit/debit cards can take three to six business days to show in your account. It’s quicker with E-Wallets taking one to three business days. In the top right hand corner of the screen is the link to the Help Centre. This has a multitude of sections that should answer any query that you have about the site. If that doesn’t provide an answer then there is 24/7 live chat available on the site.